Disassemble three like-sized frames, setting aside their fronts and discarding their backings. 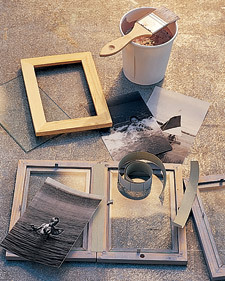 Paint or stain wooden frames desired color; let dry. Upload or scan photographs into a computer. With editing software, make the images black and white, and resize them to fit your frames. Print them onto vellum paper with an ink-jet printer. Slip the images into the frames. Using cloth tape, hinge frames together to form a triangle. Stand frames around a candle in a protective glass holder. Colored bookbinding tape; $1.75 per foot; NY Central Art Supply; 800-950-6111 or nycentralart.com.